The comprehensive view menu allows the network planner to explore the data in as much detail as they wish. The view on the left is zoomed in to a network hotspot to understand the handovers in that region. 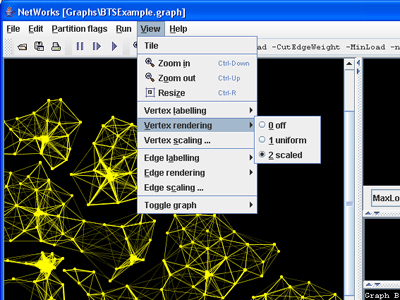 Edges are scaled according to the number of handovers and vertices scaled by call volume, to reveal communication patterns in this busy area. A wide range of options allows the view to be adjusted as necessary. Furthermore the vertices and edges can be labelled to help identify network characteristics such as regions of high call density or handovers. 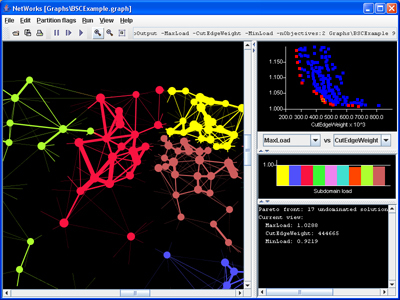 Both example graphs shown on this page are randomised test cases, generated to have similar features to real mobile phone networks.